These past few months have seen increasing amounts of my power animals wacking me on the head with ‘wake up! wake up!’ and ‘what do we have to DO to get your attention!??!! !’ The biggest wackola was a multiple encounter with Fox and Coyote over nearly a week in early March, just prior to the Equinox and my Spirit Mate’s birthday. I do a daily hike in a flood-management area adjacent to the military base I live next to; I refer to the area as ‘The Preserve’ because it’s the only place that isn’t paved over, built on and otherwise obliterated. 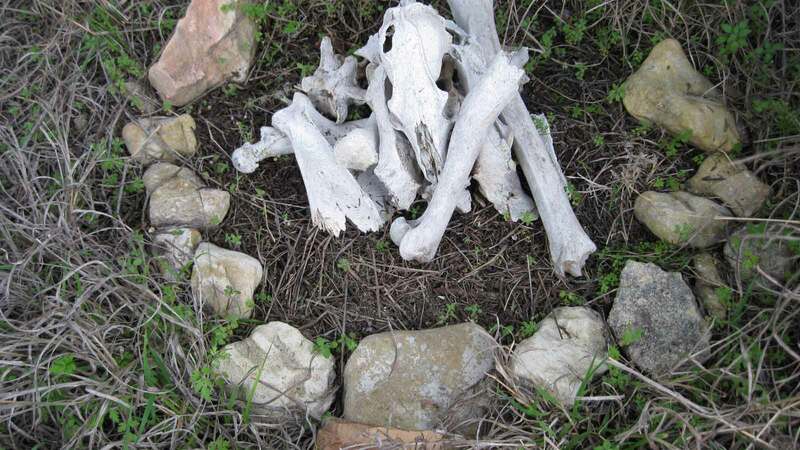 I maintain a small altar out there; and in an area that is just scrub juniper, MOWED grass (sad, I know) and some valiant wildflowers, I have seen grey fox, coyote, beaver, tons of birds, wild pig (not fun encounters), feral cats, deer and a feral wolf hybrid. I’ve been followed by owls and I even had a locust fly up out of the grass and bang me in the eye once. Ouch! My power animals tend to be wild canids of all kinds, so the timing tends to be what captures my attention. Literally, I saw a grey fox at dusk three days in a row, followed by a coyote, once in the middle of the afternoon and the others at dusk, three days in a row after that. 6 straight days of quite close encounters – literally feet away – of grey fox and coyote. There was an ‘oh crap! I didn’t see the human!’ element to all these encounters, which is rather humorous, because I talk non-stop to my husky who isn’t the most silent animal trooping through the scrub, and I’m louder than he is. Even the deer are usually amused. Fox and Coyote both appeared to me at a time I was wrestling with a very life-changing decision; so I knew it was time to really think about the messages they were trying to tell me. The decision had to do with work-life balance, the acceptance of more responsibility (and money) and where my more traditional illustration fits into all of this. I had literally been agonising over this decision and the ramifications of it for at least 6 weeks. My runes and my tarot were little help; mostly I got variations of the message ‘things are too obscure to know’. I HATE those kinds of answers! To understand the messages, I thought about Fox, about the nature of our encounters – the first two in the parking lot by the bank where he was hunting rabbits, and the third where I found his body about a quarter mile into the Preserve with his throat torn out. It may not have been the same animal, but, it really felt and looked like him. (It was a young todd.) I honored him by placing his carcass on my altar and I am witnessing him return to dust. Fox has many lessons to teach, but I think with him, he was young and he perhaps didn’t read the signs right, and got caught out by something large enough to tear out his throat and carry him a distance. This is the part that feels most significant to me. I know that a wrong decision on my part will have great consequences, and may not be able to be undone. Another element to this, of course, is that death is transformation – a letting go of the old shell and a movement to a different form – and is a positive step in one’s existence. Another element is the fact that he was killed by a bigger predator, and he took his place in the natural stream of life – he preyed on the rabbits, and something preyed on him; his passing was a natural, sustaining act for all involved. I cried for him, and I am witnessing his return to dust, but, in truth, that, too, is part of the way of things. I took from that that this situation is perhaps a natural step for me and for the folks I work with – it is time to transform and move into greater responsibility. That also ties in to the coyote encounters – I saw the Coyote after the Fox, again, three times in a row. The Coyote was always doing the same thing – moving away from me at high speed, looking over his shoulder with an ‘oh crap!’ expression. Once he put enough distance, say the other side of the meadow, he would blend into the trees and start watching. I was careful not to let on I knew he was still there. He did retreat, prudently. But, he also continued to assess the situation and when he had a sufficient buffer, he turned and observed. I took that as a wise approach and started applying it to my situation, and found many clues and answers open up, and I’m slowly coming to peace with it. I am no longer Fox, invisible and carefully timing my appearances; I have become Coyote, the trickster and bringer of fire – the passion I bring to all my design.